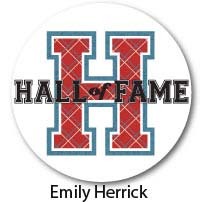 Emily Herrick of Crazy old Ladies fame. which follows her debut smash hit collection Going Coastal. I wanted to do something fun to celebrate today but I'm not into watching sports so much. So I did something that comes a little more naturally to me- I sewed. Well actually, I fused. Who can pick a winner when Cooper and Jake are both SO CUTE!!! 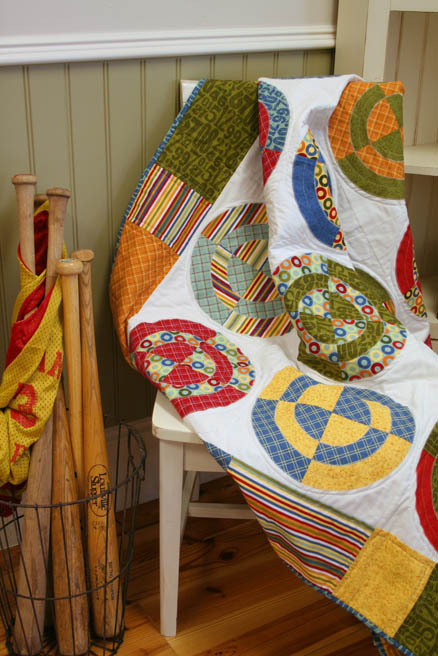 While the guys are in the other room yelling at the TV and drooling into their bean dip over the cheerleaders you can enjoy the world of quilting and fabric and hear how 'Hall of Fame' was born. I have a son that eats, sleeps and breathes basketball. A couple of years ago I had to make a run to the quilt shop and take him with me. 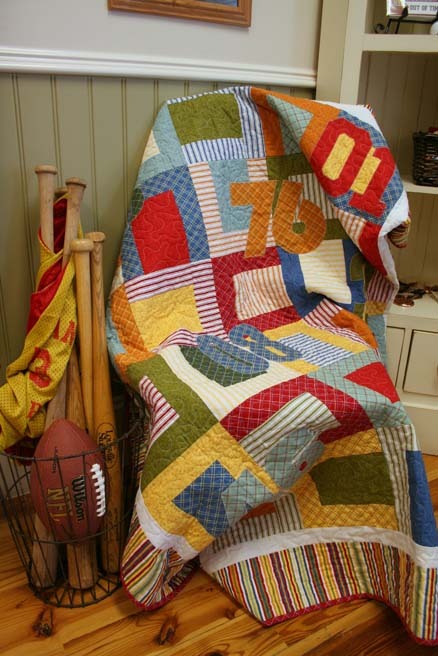 Of course he wasn't thrilled with that idea until he asked if I would make him a sports quilt. When I said "Yes" he was in and we started scouting the walls of fabric. The problem was that the selection was slim. There were fabrics for little boys, and cutesy prints with basketballs and baseballs all over- but nothing that really fit this 8 year old of mine. 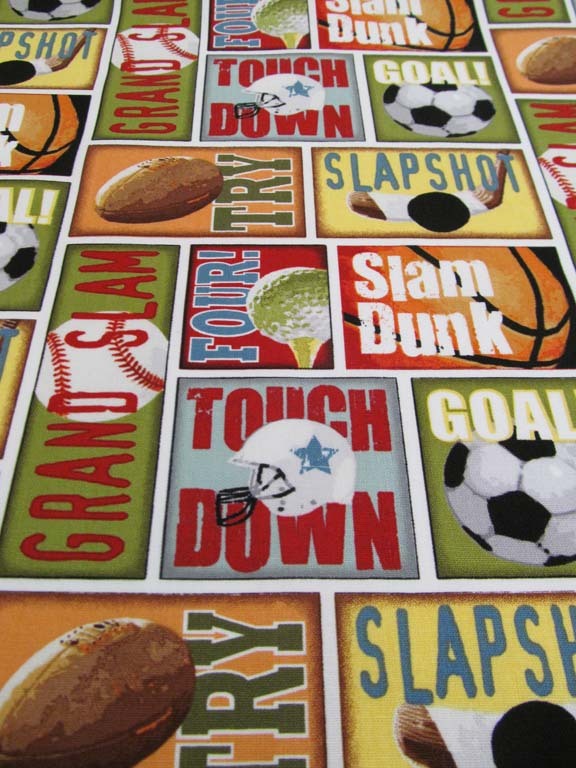 Fast forward to last year when I decided that my next fabric collection would be a sports line for big boys. Most of my fabric design inspiration comes from decor. 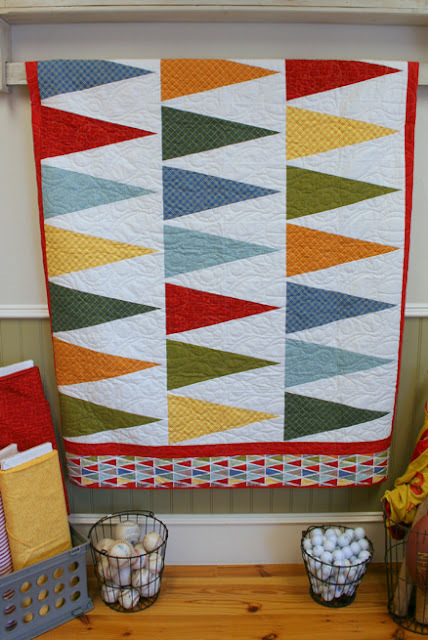 I love to decorate and coordinate colors, prints and fabrics for a space and that love has carried over to quilting. So naturally when I started to design fabric I went back to my roots and thought about decor. 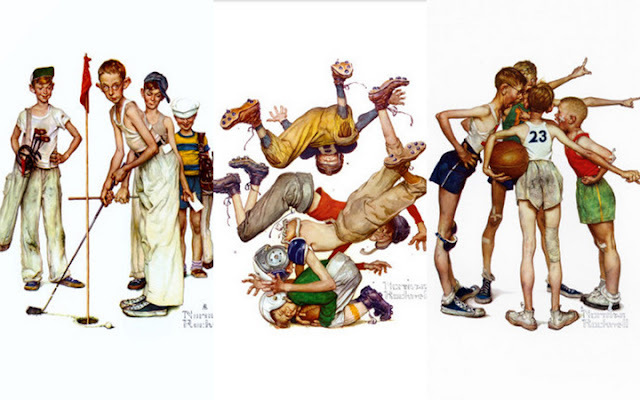 My initial inspirations came from prints hanging in my boys room. when it came to the individual designs there had to be continuity but also versatility. The collection actually started with the coordinates. I knew I was leaning towards a sports theme but I didn't want to get sucked in. I started with the ticking and the turf prints- minimal. From there I designed the plaid because I LOVE plaid. I also have an obsession with typeface so I knew the Jersey number print was a must. At this point I had several cool coordinates but they were all so separate from each other. I knew I needed a design that had more than one color in it. That's when Sport Spot was born. 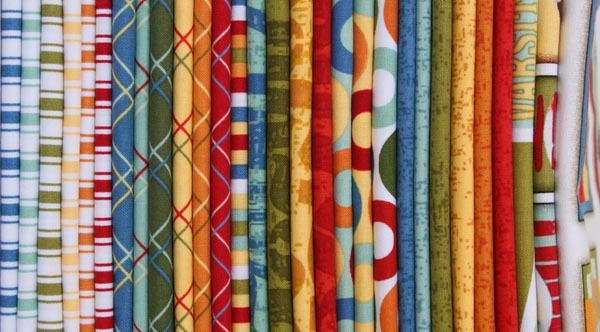 When I'm at a quilt shop looking for fabrics I definitely gravitate towards dots- many quilters do. But there are lots of dots out there and I wanted to make sure mine were different. As soon as I made the spots into rings I was in LOVE! 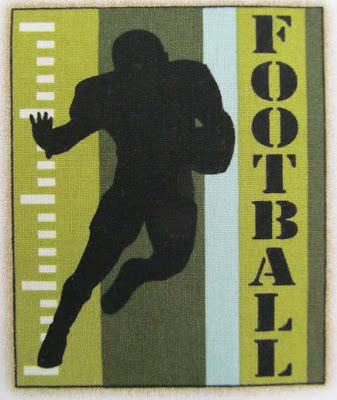 The Game Stripe print was an afterthought. I already had the ticking stripes so I wasn't sure about adding another stripe. Once it was done however, there was no turning back. In order to identify this collection as a sports collection I definitely needed some sporty prints, right? Back to my passion for decor I immediately thought of vintage tin advertising signs. I started playing with the idea of a sign for each sport. Basketball, Football, Baseball, and Soccer are the main sports that people think of so those were obvious choices. But again, I wanted this collection to be different. I have a few brothers that love Hockey so I added that. Wanting to aim for a more mature male as well as the young ones I opted to add golf in there too. Lastly I chose Rugby. Most people see a football there, but it's actually for Rugby. The pennant print and the main print "All Stars" were the last that I designed. I needed a print to tie it all together. I love collections, especially vintage ones. Old sports cards with a modern twist developed as I played around with ideas and the pennants naturally followed. When the collection was finished it was like a Grand Slam. I knew that any big boy out there was going to want this fabric in their quilts and I knew of one in particular. 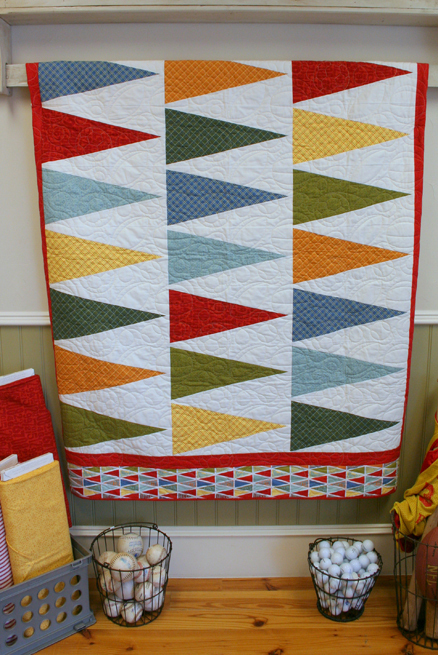 Because I was a quilter first, I always think about quilt patterns during the process of designing a fabric collection. 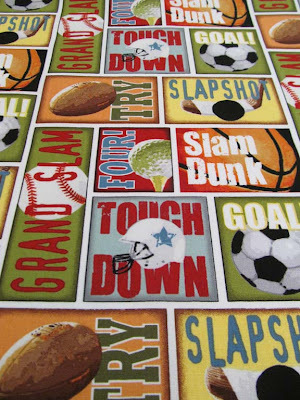 Pep Rally, On Target, and Full Court are new patterns that I designed to go along with this collection. Double Bubble, Rock Star, and Out of Time were patterns I had released previously that looked as if they'd been made for this collection. I hope you enjoyed the back story on Hall of Fame. I can't wait to come back and share my next collection with you! OH MY GOODNESS!!!! This is perfect!!! I've been needing fabric for my nephews!!!! Thanks so much for having this be the spotlight!!!! It is perfect! It is SO HARD to find really good prints for boys, but this is it! They have that warm vintage feel I just love, so so glad you were the spotlight! Nice to meet you and congrats on a wonderful collection!